If you love Clorox Disinfecting Wipes, these Homemade Clorox Wipes are a handy, inexpensive alternative to quickly disinfect that works just as well. My recipe calls for using rubbing alcohol. Not only does it truly disinfect but rubbing alcohol shines your faucets so they look great!! The Dawn cuts grease which is another thing the vinegar does not do. (Think of oil and vinegar salad dressing. It doesn’t mix!) So this recipe will really cut through that slime. You can put these pre-moistened wipes in a baby wipe or plastic container if you want to have them handy and ready to go. You can also make this mixture and just put it in a spray bottle so you can spray it on and wipe it with rags or paper towels. The best thing about these homemade wipes is that you can just throw them in the washing machine and use them again! Really! It’s that simple! *After you make this recipe, you will need to adjust how much of the mixture you pour over your rags. I didn’t have that many rags and they were pretty wet so I just used less of the cleaner. I can not wait to try this. It is such an easy recipe. I just joined Your website today,after having seen How to fold a fitted sheet.I was very interested in the cleaning receipe for Clorox wipes. my problem is that I live in Norway and don`t know the american Products like Dawn. I useually use Zalo as dishwashing by hand and and Ajax and Jiff for Kitchen and bathroom,but i suppose you are familiar with them.. I am pretty sure Zalo will work in place of the Dawn. It looks a lot like the Dawn but the main thing is that you just need to use a dish detergent that is a good strong grease cutter and from the looks of it Zalo is. Hope this helps. I’m going to mix up a batch and just pour a little on each rag as needed. I’ll just label the bottle and keep it in the bathroom. Thank you for the recipe. I just mixed up a batch of this and scrubbed the toilet – worked like a charm! Thanks! May I ask… Why only Dawn Dish detergent? I’m not exactly sure why the Dawn has to be used but one main reason maybe that it is one of the strongest grease and scum cutting detergents compared to some off brands. I say if you have another brand you love you could make up a small amount and try it. It also may be something it it which reacts to the other things. I actually had a long conversation with a dawn dish soap representative one day while trying to hunt down a certain smell of dawn (to no avail) but she told me that joy dishsoap is the same as dawn. Said its made in the same factory. Same product. Sold by the same company under another name. I haven’t tested this theory because I just learned this information but thought I would pass it along. Might be worth a try. I don’t care what she told you. Do a comparison test if you want, you”ll use 3 times as much joy as you would Dawn. It’s why I buy Dawn. It’s cheaper in the long run. How much Dawn do you use for a dishpan full of dishes? Like a tablespoon? Thank you. Cindy just a tad less than that. I put my soap in a pump bottle and usually do about 3-4 pumps. I find I don’t use as much this way because if I just squirt it in I can get carried away. One way to tell if you have to much is if you are having a hard time rinsing and getting the bubbles off of your dishes you are using too much so cut back. Too many bubbles means too much soap and too little means not quite enough. I don’t have any so I can see what the ingredients are, but I’ve always heard that dawn has ammonia in it….. Could that be why recipe calls for original dawn? I don’t know but whether it had ammonia in it or not probably doesn’t really matter it is I imagine more of the fact that the original Dawn was better at degreasing and cleaning things then the new ones they have now. For example I always use my dish detergent to clean my glasses and it work great for years until one time I did it with the new dawn which had oil of olay in it. I couldn’t figure out at first why my glasses had such a greasy smudge on them then it “dawned” on me (no pun intended) 🙂 but the oil of olay in the dawn was leaving a residue. Don’t use Puffs tissues on your glasses either, you’ll get the greasy thing there, too!, LOL. I’m won’t pay for Puffs, but my daughter won’t use anything else, my glasses were a mess til I figured this one out. It does not have ammonia in it. I imagine it just has more surfactant in it, which helps break down grease. It may have something to do with the safety of it, Original Dawn is used to treat animals that have been stuck in the sludge from oil spills. If it is safe on them I would have to believe that it would be safe if left on a surface after cleaning. ya know, they used to sell a detergent called “era” .. not sure if they do anymore .. but every time i see or hear about dawn dish detergent, it reminds me of the era clothes detergent .. era was great if u had really dirty clothes and greasy clothes too (esp if u were a mechanic) ..
my mom used to buy that and wash our dishes with it .. and then when dawn came out .. she uses that and if something needed to be pre-treated it gets a little dab of the dawn on it ..
maybe u r right jill .. it probably has to do with the fact that it is the strongest . also, its safe enuff to help with the animals trapped in all that oil (remember the commercials the save the animals filmed and u could see them washing the birds in dawn and the next scene the bird was healthy looking? .. thats a great advertising idea to promote how well the product works and its safe to use on animals .. (well not sure how safe but it did help those animals) ..
dawn is great for fleas on animals just use straight from bottle use the first dawn they came out with. Why the original? I just bought Dawn pure essentials,I wonder if I should exchange it? The formula is different and it seems to work better. I loved Era also. Not only did it do a great job getting the clothes clean, I loved the clear plastic bottle the powder was packaged. Easy to pour into the measuring cup/bottle top & you could see how much you had left. Yes, they still make Era. It works great, economical & one of the only detergents that my family & I AREN’T allergic to, believe it or not! kitchen counters, refrigerator handles, etc.? yes Janice they are just an all purpose cleaning wipe. interesting that you posted this recipe. I recently discovered that a dish soap/alcohol mixture cleaned my oily incense making counter and sink and even shined the sink and helped keep it shine for several days! Thanks! Thank you! 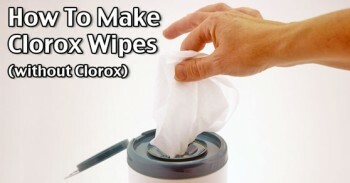 I’ve been looking for a DIY for Clorox wipes that doesn’t involve vinegar and tea tree oil. I have granite countertops (vinegar is a big no-no for them) and HATE the smell of tea tree oil. One question about the Dawn, though. Does it matter which Dawn you use? I use Dawn Hand Renewal because it smells good and makes my hands feel soft. Yes, the regular blue is best but I’ve used others with ok results. I have used this recipe in a spray bottle but am excited about using it as wipes. My husband had 15 shirts with his company logo that had to be destroyed so I cut them up into rags. Now I know what to do with some of them. Great idea!! I use straight rubbing alcohol on toilet paper to clean my bathroom mirrors! It looks great and no streaks! You gave me a great idea for pre-treating my laundry! I think I am going to make up a diluted solution of Dawn and water to spray my clothes. Spray and Wash works, but I am becoming more sensitive to the particulates in the air from the spray. I was using diluted laundry detergent, but that doesn’t seem good enough. Try using 1/2 cup Blue Dawn and 1 cup peroxide. Mix, spray item, let sit 2-3 minutes, and launder. This is also really great for upholstery and carpets — it sit, scrub with light-colored cloth (if light colored fabric) and blot. If item feels soapy, blot area with wet cloth, then dry. Let dry 24 hours. This mixture can be stored. Probably 75% of the time if you just clean things with regular soap and water they will come clean. Peroxide does act as a bleaching agent so just be careful using this on dark colors because it could bleach out the color. Problem: alcohol does kill some germs, but mostly just cuts oils so that germs wipe off a surface. We tested this in a microbiology lab. E-coli grew on a petri dish with paper disks soaked in rubbing alcohol.The chlorine bleach (Chlorox) killed every germ we thought to streak the plate with. My money for serious germs in bathroom and kitchen is on real Chlorox wipes. Clorox wipes do not contain actual chlorine bleach though. Homemade and store bought are about the same, except the cost. Thank you for posting. I owned a restaurant and health inspector taught a small amount of bleach in water is all you need to disenfect nonporous surfaces. You have to be careful handling bleach since it is a strong chemical. The thing is if you use the right amount of bleach it is no worse than even some of the more natural things people use. What happens is that people tend to use way more than they should so they smell fumes and other things. That is not the bleaches fault the fault of people using it in the same way cars are very useful and helpful but it you use them wrong and drive recklessly not obeying the driving laws then they become dangerous and can hurt people. I made this recipe just now and it suds up quite a bit- does yours? I used the blue dawn ultra concentrated and only one tbs. I am thinking I will need to use a tsp or half a tsp next time. Have you had this problem? I don’t want soap scum on my counters. Cut back on the Dawn. To be honest I don’t like to use store bought or homemade wipes that much. To me they all leave a film that I hate to have in my bathroom. I remember years ago when this famous talk show host promoted the original bathroom wipes and how wonderful they were. I tried them and hated how they just left a coating on every thing. Plus I think we often make cleaning and using homemade or any cleaning products way to complicated. I would just put a little rubbing alcohol on a rag and run it over every thing and then wipe with a dry cloth where it needed it. mb – don’t use the “ultra concentrated” Dawn. Use the regular, old blue Dawn. If using the amonia on rags, is going through the dryer on reusable rags harmful in any way? No not if you wash it ahead of time. Just don’t use fabric softener on the rags. That will cost him to be less absorbent. You can wash them with just a little bit of grated Fells Naptha soap, and dry them without any added ingredients. I understand there is no bleach in Clorox wipe but is there anything wrong with using bleach in homemade wipes? If you are using them just for cleaning you could replace the alcohol and ammonia with Clorox. Do not mix ammonia with the Clorox because there will be a chemical reaction. Many people think it is vinegar and Clorox you can’t mix but it is Clorox and ammonia. I try not to mix to many things anyway to keep it simple. Also you don’t need to use much. Always thing less when it comes to Clorox. For this recipe 1-2 lids would be plenty. I just wanted to say here that my Dawn indicates that it should NOT be used with any type of bleach due to toxic fumes. I use Dawn also to make laundry detergent, and it does create dangerous, toxic fumes if even a tiny bit of bleach is mixed with it. This recipe does not have bleach in it. Just remember that bleach is only active for 30 minutes after it comes in contact with water or some other chemicals! If you leave it in a mixture, it will still have a distinctive bleach smell, but do absolutely NO good as a disinfectant. May. Ask where you got this information? Not sure what information you are meaning exactly but usually we do quite a bit of research over the internet, the library and sometimes talking to professionals in these areas when we can. We look at both sides of the pros and cons and try to choose the ones that have done the most accurate studies and then throw in some common sense and what seems to be working in the average persons life. By that I mean if there are 20 people using certain natural products and a year after using these products 90% of them are having problems with mold then common sense tells you something isn’t quite right. One thing I have learned over the years is we need to really pay attention to what is being said or written. For example I was reading a newspaper from a health food store not to long ago. In it they had written several articles about different products and in every single article was used these phrases in some shape or form – “This could, may, is thought too, we think it might, there is a chance” concerning how the products work. If you look at the writing on certain foods there are words like “the national — association says it could help with —- this or that illness”. There are very few things that state it is proven definitely that this does this or that. As far as the vinegar goes even the companies that make the vinegar say that it only kills 80 -82% of mold and germs (viruses). What that means to me is that after cleaning with this 18% of the mold and viruses are there to keep growing and multiplying and under the right conditions this 18% can grow quite rapidly. It is not surprising to me that the more people are using natural products the more people are having problems with mold in their homes and have started suffering more from mold allergies. There may some truth to this statement. I used to work in a daycare and we had to mix a bleach & water solution each morning to clean with that day (wiping down counters, tables, changing tables, spraying toys at the end of the day). Every morning a fresh solution was to be made because the previous day’s solution was no good the next day, we were told. Could you use this same solution and apply it the way you make homemade baby wipes, using the papertowels instead of the rags? Does it matter or should there be a preference between ethyl alcohol (ethanol) and isopropyl alcohol? Also, instead of rubbing alcohol, could we use an alcohol like vodka? I just want to know which would be the best to disinfect surfaces. I use isopropyl (rubbing) alcohol. I think this is best. You could use vodka I suppose in a pinch but I think it might be more expensive and I always have rubbing alcohol on hand. I don’t drink or buy vodka so I don’t know much about it. I really think the rubbing alcohol is better. Thanks for this! I got some glass jars from the dollar store and filled them with rags I had from some old T-shirts that I cut up and with old baby wipes from back in my cloth diapering days. There is one jar sitting on each bathroom counter. I love that these are not toxic or wasteful. Now I just do a quick swipe every day or two, and I have been able to stay on top of cleaning duties much better! As an added bonus–my girls (5 and 3) love to help clean, and if they get the urge to wipe down the bathroom counters or walls or baseboards, I don’t have to worry about what they are using! I have been using Clorox wipes for almost a year now. At home I usually clean my bathroom and kitchen floors using this. That is how I keep my floors always shiny. Thanks to Clorox wipes. Thanks for the info. Many people are so frighten of using bleach but we have it for a reason. Vinegar and alcohol doesn’t kill near as many “bugs” as bleach. The biggest thing people do wrong and why they have a reaction to bleach is because they use way to much. It takes very little to do a good job. I sometimes wonder if we won’t have a epic flu disaster sometime in the future because so many people have stopped using bleach and gone with more “natural” things in the same way we have started banning pesticides and since then we are now having a major out break of bed bugs and other critters. There is a reason our ancestors changed over from using all natural things and it was mostly because they weren’t working as well and people were dying. I haven’t read it for myself yet, but someone told me that the ones who live like those in ancient times will survive (I’m sure I messed up the wording, but you get the idea… Lol)… I’m actually trying to make the switch to a more ‘natural’ approach… I don’t trust the government and don’t want to rely on them… Colloidal silver was used prior to antibiotics… These killer superbugs, like MRSA and resistant strains of c diff, are caused by antibiotics and overuse of cleaners… People living in underdeveloped countries have better immune systems than those in developed ones, like the good ol USA. If there were an outbreak, we’d probably be the first to go! Modern farming techniques have taken out the necessary trace minerals and nutrients for our health… Did you know salt was as valuable as gold in ancient times?! Not the health destroying white table salt on many people’s tables that’s been refined and bleached and filled with chemicals to look pretty and not clump that causes a number of issues… Real salt that contains the same minerals found in the body… How God created it… I don’t think we should mess with His work ;)… I agree with you about the bleach! I’m one of those afraid to use it because it discolors what I don’t want discolored! Lol… Yes! Only a small amount is needed! That is one of the funny things about my daughter. She touches and sometimes has eaten some of the most disgusting things. She has a low white blood cell count. But she is the last one to get sick, if she does get sick, she doesn’t get it as bad as the others. My mother-in-law has said that every child has to eat a pound of dirt. They are also finding that a lot of people with asthma grew up in a house that was too clean. We clean house and wash our hands, but don’t try to sterilize our house, even when we had to keep Beth well for heart surgery when she was little. I believe we have to exercise our immune systems to make them strong. All that said… Bleach has it’s place. I think that might be in extreme cases when someone needs to be protected from outside germs, like my little friend whom is going through chemotherapy or in the hospital. Wondering if Sal Suds would work instead of using the Dawn in this recipe has anyone else used it? Sharon, not sure how old this is but Sal Suds will work. Try half the amount and see if more is needed. It makes a difference if you have soft or hard water. I’m sorry I tried these using the 2 Tbsp. of regular Dawn as suggested…waaaaayyyy too sudsy! I even tried rinsing some of it out, which of course rinsed out the other stuff too. I can’t imagine using these, then having to go back a second time to rinse everything down. Ended up throwing out the whole batch, rewashing the rags & starting over using less than 1 tsp. of Dawn. Brenda we usually tell people these recipes aren’t set in stone. There is nothing wrong with adjusting the recipe to what works best for you. We try to teach people to use their own common sense and think – if this isn’t working then ask what is wrong and how can I fix it. Sometimes things like even having thinner, smaller or rags made out of different material make a difference or softer and harder water. I personally don’t use many homemade cleaning products but so many people want the recipes for them that I post them. To me it is easier just to put a drop of detergent on my dish rag and wipe things down in the kitchen or in the bathroom I prefer grabbing a rag I use for in there and wipe things with a little rubbing alcohol for a quick wipe. If I make up wipes to me that is an extra step and more work then the way I do it. That is just my preference because I find even store bought wipes leave a film on things and I don’t like that at all. I sometimes use wipes for my toilet but I don’t use them for anything else. I remember when Oprah first came out and said how much she loved wipes. The whole world jumped on the band wagon and started using them but I was never impressed with any of them. They are fine and if they work for you go for it. I just don’t find they save me any more time. it’s a little disconcerting that you don’t use the recipes that you make..? My daughter uses our recipes all the time. I just have not jumped onto the “homemade” bandwagon like maybe the younger generation has because I did homemade years ago before it was “cool” to do and found there are much easier ways to do things. For example instead of spending all that time buying ingredients, measuring mixing, finding a container etc. for baby wipes it was just as fast and easy to just keep a roll of toilet paper on my changing table and quickly wet a washrag to wipe my baby’s bottom. It was just easier for me. But at the same time my daughter used the homemade baby wipes. You don’t need to be concerned. We have a really good homemade applesauce recipe that every once in awhile I make up but I only make it if I have apples given to me because I can buy applesauce cheaper then making it myself and it tastes no different. I just have better things to do with my time. That doesn’t mean there is anything wrong with the applesauce recipe or anything wrong with me. I am just using common sense and things that fit my situation at the moment instead of worrying about doing the latest “in thing” or making sure I am doing what others think is the perfect way to do something. One thing I teach above all else on this web site is everyone’s family, situation, and life is different. You need to do what fits your needs for you because everyone is so different and just because something is homemade doesn’t mean it is the cheapest, easiest or best way for me to go at this time in my life. Baby wipes and other wipes were invented for convenience by the time I boil water and mix this and that it is no longer an easier way to do something or a convenience so I just use toilet paper and a washrag. Right on about the water hardness. I spent many years in the private water treatment industry. I assure you, my water is soft; not salty, not slimy. I wash a sink of dishes with 3 drops of Dawn – always Dawn – if you need to ask, then you’ve never used Dawn. I cannot use any types of detergent pods, it’s just too much soap. I prefer to use steam to disinfect. Steam and responsible use of sodium hypochlorite. Also, for any who find themselves comparing countertop materials for a kitchen remodel, I have one suggestion. Get the CORIAN® sinks and countertops. CORIAN® is germ, bacteria, and virus resistant, and blemishes through the years are easily corrected with a palm sander, 400-800 grit sandpaper, and a little bee’s wax. I agree Kris. Corian is the way to go. Granite and marble may seem “cool” and all but in a practical world for the price and all it really isn’t worth it. It is like the difference of wearing a beautiful pair of leather boots with heals to hike through a damp forest or a pair of sturdy hiking boots. The only time I find wipes to be convenient is when I’m shopping to wipe down the cart for my child. But even then, (when I really had to be careful because special health concerns) I brought a bottle of alcohol in the car and a wash rag to wipe down my cart. I don’t even like using wipes for diaper changes, only a wet rag. Can you add some essential oils to this? Why couldnt you make these up like baby wipes,using paper towel? You can they are basically the same thing. Do these need to be washed in a load by themselves? No they don’t because you don’t use Clorox in them. I just drop mine with the rest similar-coloring laundry. as for the rags with bleach on them, I rinse it in the sink really good and let it air dry a before dropping it in the dirty laundry. I am not running a separate wash just for a couple of rags, then it would be cheaper to use something disposable. Yes this is true. That is why my nasty ones I don’t even rinse because by the time I use all that water rinsing I may as well by paper towels. I tried a different recipe, but after a week or so the damp wipes started to smell really bad. I assume they were starting to mildew. Any suggestion? You said you tried a different recipe and without knowing what was in I really can’t tell what the problem would be. Our recipe does have alcohol in it and that may make the difference because it kills germs much better then if you use a recipe with just lemon juice or vinegar alone. if you use water in any wipes recipe, you MUST use distilled water, or boil your water first. Regular tap water, or even drinking or spring water has minerals and things in it that will go bad rather quickly and spoil the whole thing. You can use a preservatives, but I would just put it in a spray bottle and spray it on a rag…I use Viva paper towels bc of their thickness and durability(or a wash cloth)when I make homemade baby wipes. Hi Jill and Tawra! Love the home made wipe recipe. I just made some up and cleaned my bathroom counter. Works great. I used one spoon of the original dawn. I put some in a spray bottle. Love it. Also someone mentioned the detergent ERA.It is still sold in my neck of the woods lol! I hate to use bleach here at home because hubby can’t stand the smell of bleach…literally, he can’t. Ditto for too much vinegar and ditto for alcohol. I wish I could use homemade cleaners but everything I have tried bothers him. He just has too sensitive a sniffer. I had to use disinfecting wipes on just about everything when there was an outbreak of norovirus where he works (he is a nurse and clinical coordinator at a veteran’s home) and you better believe that was a really fun time. And the poor guy still got sick. I haven’t tried the tea tree oil is it expensive to get? I hate to put out a lot of money because if hubby can’t stand it out it will go. Marcia, you should give peroxide a try. I have tried using just plain alcohol for cleaning but it takes my breath away, literally. What I have started using is Peroxide. It is an excellent germ cleaner and has no smell. It is also great for cleaning windows, countertops, bathrooms, etc., etc. 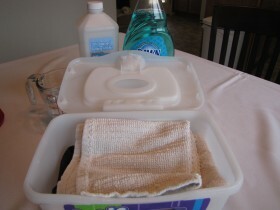 I really love this recipe for cleaning wipes, esp. bc it doesn’t involve pine sol or Mr. Clean, but I am concerned about the rubbing alcohol evaporating. It evaporates rather quickly unless kept sealed tightly, and I want to make surface wipes that are in a baby wipes container (and not a jar or other airtight container). Has anyone else battled this? I used this recipe, only I used a few drops of dawn instead, added 2 oz of vinegar and 1.5 cups of water instead of one. It works good on my windows and mirrors too. Before I used a mix of water and vinegar, and while it was good on mirrors, it would not get the stubborn stains on my white-painted doors and light-colored walls. This cleaner mix is getting some stains out and makes the surface more shiny. And I use it on everything except for the wood. We use a lot of wipes at my house, probably too many wipes. I can’t wait to try this concoction. Thanks for the idea. Can I use a homemade dawn(fels naptha, washing soda, vinegar, and water solution) in place of dawn? I know you were saying dawn cuts grease and vinegar doesn’t but figured I would ask.. I might try and make both to see which works better. The biggest reason I find for making my own products is the eco impact. Using Dawn defeats this purpose. Good for Courtney for trying to be responsible. this sounds amazing I cant believe the amount of items that has a use for the blue dawn< however I think origanally the post was more for not having to purchuse any store items and stay away from any chemicals which lets face it if the Dawn does all that then it it full of additives and chemicals.not to mention now you have to wash said cut cloths. Is there a recipe without dish soap? When I use the wipes, it leaves behind the soapy residue. Is it supposed to do that? Am I supposed to rinse the cloth and wipe over with water? Thanks! Most wipes – store bought or homemade- leave some kind of residue behind even the ones that say they don’t. That is why I don’t use them very often and when I do I wipe everything dry after I use them. You can either cut way back on the detergent or leave it out altogether. Personally I just pour the rubbing alcohol on a rag and wipe and that works great for me but so many people want an actual recipe. Sorry it is one of my pet peeves that homemade cleaning products are the rage now and they tend to make them way too complicated. For example you don’t need a special homemade counter top cleaner. Most of the time good old hot soapy water gets it just fine with much less work. But many think the more that is in it the better it works. You can make them with water and rubbing alcohol which wouldn’t smudge. I am semi retired from a disaster restoration company, and I can tell you that we have cleaned some really disgusting stuff! We clean up after water damages, floods, smoke and fires, and sewage back ups. I prefer a different method. I also switch between using ammonia and chlorine based products safely. Never mix them as it creates a poisonous gas that can kill you. Besides, if the chlorine is to strong and you can really smell it, dilute it with water. The same with Ammonia. The Nose Knows. The formulations presented here are fine for general use and everyone will have a particular preference. Also wear latex or nytral gloves to keep your hands from smelling. 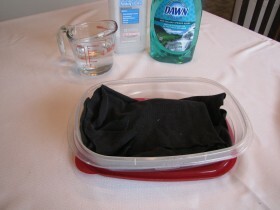 First, using a spray bottle for the solutions, spray it on the rag or towel itself. Not on the object to be cleaned. Use only that towel for that a specific use and when dirty set aside. One towel can be ammonia based and another chlorine. Just keep the separated. 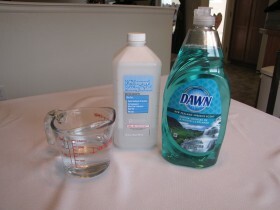 So you can clean just about anything with the dawn (regular, not concentrated), ammonia, alcohol solution. If you want to ad some blue food coloring you have glass cleaner In the cleaning business this is our primary go to cleaner except for greasy cleanups. That takes a more aggressive cleaner and why one would use more “dawn” in the solution. Mold and mildew are separate issues and require different cleaning techniques. If the mildew is in the bath, spray on the towel first to wipe down the mold and mildew. Always wipe in the same direction (this traps the mold spores in the towel) Never spray directly on the mold or mildew as this spreads the mold spores. Be sure and fold the towel or rag every time you wipe to catch the spores and when finished………….throw the towel or rag in a plastic bag and then throw away. Professionals do it this way and it works. After it has been wiped down feel free to spray with the chlorine to “bleach” the grout or other surfaces. If you can smell the chlorine, do NOT use the ammonia. and vise versa. When the chlorine or ammonia odors have dissipated, you can use the other product. As for Vinegar, it is a very good acid, harmless and can really cut through many types of soap scum and dirt. So I use three different solutions to clean, ammonia for general cleaning. Chlorine for heavy stains, disinfecting etc If using in ana area fro food preparation, always rince these cleaners away. Vinegar to cut through scum and dirt. Thank you Jim. Finally someone who has a handle on all the different cleaning products and what they really should be used for. I have been wanting to write a post just like this so thank you. People get so confused on the purpose of these different products. Another thing you mentioned that I holler about all the time is don’t spray your cleaning product directly on what you are cleaning but on your rag. Besides the good things you said it also saves on the amount of product you use (the average family uses $50-$90 a month compared to the $20 or less a year I use) and it saves on rinsing and rinsing and work. Good tips. We are a military & have lived in many places in the states & abroad. The people that had trouble with the recipe should realize is the having or not having hard water could affect the results. It’s even the same for other stuff, take baking for instance. 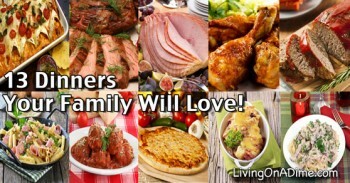 I’ve made a family recipe in difference areas, the exact same one & the end result doesn’t always produce the same results. Btw, this was an interesting read & am glad to have found this site. I agree with the post about being too clean and I like clean. I use vinegar as a disinfectant besides bleach depending on what I am using it for. It is funny being said that bleach doesn’t harm the environment. I was weeding around my stairway outdoor and a teacher was walking past and told me I could pour bleach around the area and the grass & weeds or anything else would NEVER grow back there. If I ever decided to relocate my stairway and grow anything in that area I would have to remove the soil with new untreated soil. Mainly I use vinegar for home remedies and as for dawn dish detergent I have tried it and went back to sunlight. I had to keep adding dawn and I am single so not a lot of dishes and I don’t like greasy foods so not much but dawn didn’t do the job as well and by the time you finish it is far more expensive for how much one has to use. Your comment is the perfect example of really needing to study things a lot before you make too much of a judgement on them and not just believe what the media and others say about things. So many don’t use bleach because it is harmful to the environment like the weed killing thing but the number one thing I use when I don’t have weed killer on hand to kill my weeds and grass is vinegar so using your logic I could say vinegar is just as bad as bleach for the environment. The thing is there are very few things that aren’t harmful to the environment. The secret is using it properly, wisely and in small amounts. Cars are bad for our health but we still use them all the time. They help in daily life most of the time but if we miss use them by speeding, testing while driving and other things people get killed. Yes I have stopped using Dawn awhile ago. I use Ivory now. I have tried many store brands and things but so far Ivory works best for me. I think a person needs to try different things because of harder and softer water the different detergents react differently to them. You can but since I am not sure what is in it I would leave out the ammonia in the recipe. You can mix ammonia with alcohol, or vinegar but not bleach. Dawn does have something in it that WILL NOT mix with bleach. I learned this the hard way! Felt like I had burned my lungs. Once again you don’t need to use clorox in this recipe so there is no need to worry about it. In other things though when you use it be sure you don’t use too much bleach. There may be something in it but I used the original Dawn for years with bleach and never noticed any thing. I do only use a very very small amount. When you think that only a few drops can disinfect a gallon of water that shows how little you use. If you use too much vinegar the fumes can bother some people too so think – little or don’t use it. It’s the ammonia in the Dawn that is doing the job of cutting the grease, and thus cleaning. I don’t believe that it has any more chemicals than any other “artificial” cleaner – ie “detergent” v. soap. Hi. Thank you for this and your great tips. Just wondering… for those of us in other countries, Dawn, it is a liquid dishwashing soap. We don’t get it here. I suppose I can replace with our strongest brand here? I am just wondering if yours smells nice, like or does it smell like soap iykwim ? Ours smells really soapy and they add a slight lemony fragrance. Would that be an okay substitute? Yes Dawn is liquid dishwashing soap Lindy. It is good because it is cuts the grease on dirty dishes so well so if you have something like that I am sure it would work too. The smell doesn’t matter and I think anyone that is a grease buster would work fine. There is so much talk about these used in the bathroom. Is it ok to use around the house in general like kitchen? I plan on making this into a spray bottle instead of wipes. I am more interested in having a good kitchen cleaner versus bathroom. Jill, I am like you on generally not being too keen on making my own cleaners because sometimes I think it can get costly to prepare if its ingredients you don’t typically have on hand. I do agree though that I think alcohol alone makes the best glass cleaner. I have also heard for cleaning laminate flooring to use ammonia, vinegar and alcohol to do the floors. I’ve done the other stuff but alcohol was new to me but it was used to help it dry faster. Yes you can use this as a general all purpose cleaner for any where in the house. The window cleaner in Dining on a Dime has the same ingredients too as do many all purpose cleaners. Thanks so much for this recipe. I think the reason for original dawn may be that all of the new ones are concentrated which makes your mixture really sudsy. Also, someone mentioned the chlorine in store bought clorox wipes but they don’t contain any. I’m going to have to give this a try. I’m always looking for good ways to save time and money. Try WalMarts version of Dawn, it is just and good and cheaper. I have a question if you can help. I see your recipe for homemade wipes. Can this recipe be used in a container that still has the Clorox wipes but dried out or should I not use the ammonia in the recipe? I also have another question, one person said that they used this recipe to clean their toilet. Was that only the outside of the toilet or did they use it at water level to remove stains? Thanks. Mary you shouldn’t mix Clorox and ammonia. I’m not for sure but I think the reader probably used it on the out side of the toilet because that is what store bought wipes are used for.. If you have stains in the toilet some people use a pumice stone to remove them but I find cleaning my toilet with Comet works really good for this especially if I keep using it on a regular basis. Many people love Bon Ami and Bar Keepers Choice for powder cleansers and they are ok but i prefer the Comet because it has bleach in it and seems to remove stains better then the other too. If you are looking for the convenience of actual Clorox wipes, I just dried out a box of baby wipes and poured the bleach over them. Might want to dilute it a bit, but you can just throw them away. Great for travel and bugging out. My husband and I just remodeled my boys’ bathroom. I made a batch of these wipes for them to use to help keep their newly remodeled bathroom clean. The boys use them and love them. No more fighting about who has to clean the bathroom because it literally takes them 5 minutes to wipe down the surfaces and throw the rags in the laundry basket. On a side note, I have tried to use the brand name store bought wipes before. The boys did use them and boy did they use them…by the handfuls! I figured out really quickly that a budget could go bust in a hurry to clean a bathroom on a regular basis with those. The boys like the more substantial feel to the rags (I bought a bunch of Dollar Tree clearance wash rags for 50 cents a package of 4 in a light tan color to differentiate between bathroom wipes and regular face clothes). Thank you for posting this! About how many cut up rags do you use in 1 batch for this recipe? At the last of the recipe it says 24 rags cut about 4×6 ins. Of course you can adjust it to different sizes. Would you be able to tell me when one uses ammonia & when one uses chlorine for cleaning ?? With regards using alcohol when making your own wipes, won’t the alcohol dissipitate after a while & then the wipes will be of no use ? Use ammonia as a degreaser or grime buster. For example I use ammonia when I clean my kitchen floor sometimes because it doesn’t disinfect but it will clean the grimy grease and build up you can get on a kitchen floor. It is also good for cleaning the grime off of places like the top of kitchen cabinets and things like that. Chlorine or bleach should be used when you want to disinfect something. For example I will put a little in my dish water every once in awhile to disinfect my counter tops or to wash things after I have been fixing raw chicken. I also would use cleaners with bleach in them to clean my toilets and many areas in my bathroom. Bleach is really better at making sure the germs are killed. The main problem with bleach is the fact people get carried away and use about 100 times more of it then they need to so they have a problem with fumes and such. People are have been using vinegar now for cleaning but it doesn’t kill everything and that is part of the reason that I believe people are having more problems with mold and infections. I would trust plain soapy water for cleaning and disinfecting over vinegar. When my grand daughter was a preemie they had us scrubbing out hands with soap and water to make sure we were germ free before we touched her and didn’t have us use vinegar. I always think if vinegar was as great as everyone thinks why didn’t they have us use vinegar over the soap and water. Vinegar is great though for mineral build up on things like hard water spots on faucets and windows and for rinsing clothes in in places that have hard water. As far as the dissipating goes with the alcohol I don’t know how that works. I personally don’t use wipes at all. In my mind it is just as easy for me to grab a rag (which I toss when I am done with it) and put a little cleaner on it real fast as it is to spend time cutting a roll of paper towels in half and messing with mixing all the ingredients and messing with that part. I just found this recipe today and I have a question — wouldn’t the wet rags get mold on them sitting in a container? In my household, 24 rags will go pretty fast with three bathrooms and eight children who clean bathrooms and like to use an awful lot of Clorox wipes. That’s why I’m looking for homemade alternatives. But I’m concerned the mold and mildew will build up. I’ve don’t this sort of things with homemade baby wipes using paper towels, but not actual rags. It does evaporate but it is perfectly fine. This did not work at all. It was very soapy and I had to rinse it several times. If it was too soapy cut the amount of detergent in half. I love the simplicity of this recipe. It’s amazing the cost of Clorox, and yet the amount of money saved when you decide to make things yourself. I will definitely be giving this a try. Most likely placing it in a bottle as to prevent the little ones from trying to sneak into a plastic baby wipes container. My 2-year-old is a pro at getting into the wipes container. Way too much dish soap. I made these and completely disappointed in the amount of suds left behind on my bathroom sink and chrome fixtures and faucet, when dried it left a soapy residue. I followed the ratio, but think far too much dish soap. Will have to go back to the drawing board. I wonder if it was the brand you were using or something. These recipes aren’t set in stone so you can cut back on anything you want to or add to it too. I followed this recipe exactly – unfortunately, this left streaks everywhere on my counter tops/stove top/etc. Is there something I can add to the receipt or change to prevent streaks? Jessica I am not sure what to tell you. I know so many people use these and have no problem with them. It may be the color of your counters or something but to be honest Tawra and many others have used this recipe and loved it but I personally don’t use any type of wipes at all boughten or otherwise because of this very problem you mentioned. Occasionally I have bought some wipes of different kinds just out of curiosity and I don’t care what the brand or what they are for, they always leave streaks. I just don’t like them. It probably is not the wipes themselves that is the problem but when you use anything -homemade, store bought wipes, regular cleaners, homemade cleaners or just plain soapy water if you do not rinse or at least wipe with a dry towel or rag it will streak. Even plain water will streak. The secret to a shiny kitchen or bath is to wipe and dry everything with a dry towel or rag. That is part of why I don’t use wipes of any kind either is because for me it is more work to use these homemade cleaners than just wiping my stove, and counters down really good with my hot soapy water, then quickly drying them. I will add a couple of caps of bleach to the water if I have had raw meat or something on them but that is it. So cheap and easy. You could use it on Stainless Steel but I think granite needs special cleaning so I am not sure on it. I made this recipe today omitting the ammonia and only used less than one tablespoon of original Dawn. The resulting cleaner was extremely soapy and I had to rinse several times to get the suds off the top of my freezer. I mention this because it did clean well, but next time I will try using less than one teaspoon of the Dawn.